The excitement, anticipation, anxiety, stress…I like to call these the pre-adventure feels. 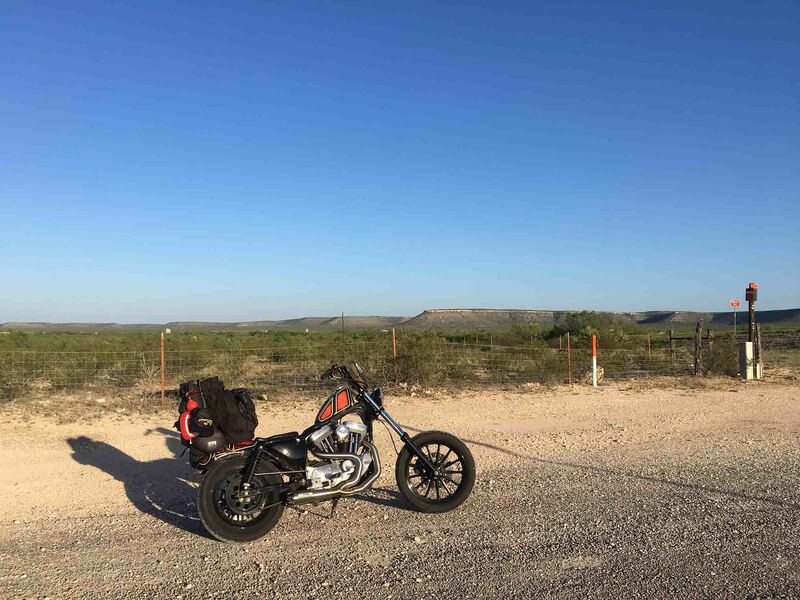 Taking off on a motorcycle, regardless if it’s an around town putt or an out of state adventure, can bring emotions upon you that maybe you didn’t even realize you had. With Babes Ride Out around the corner and so many women hesitant to travel to the event alone, I’m here to tell you GO FOR IT!!!!! You’re going to have the time of your life. 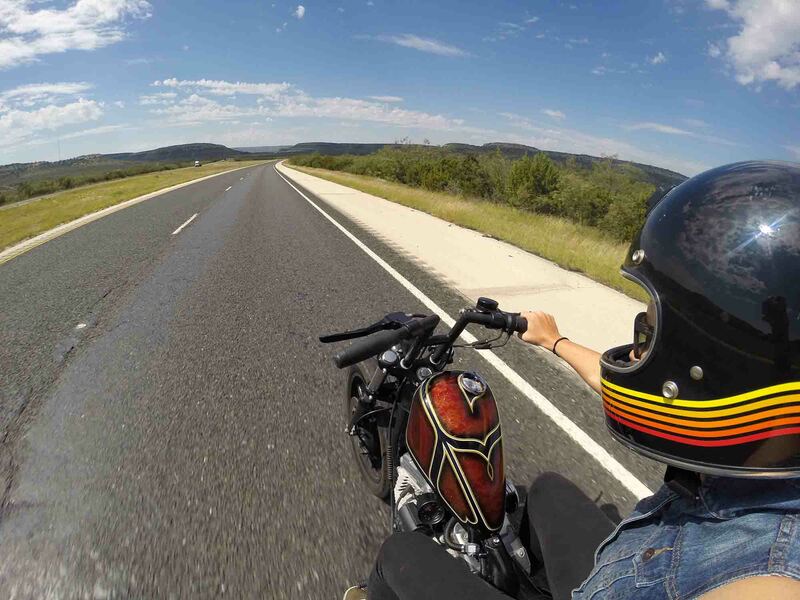 Here are a few tips to help you feel at ease, grab that clutch and to push down on that shifter and get your trip started if you’re feeling nervous about heading out alone. 1. Be sure to sign up for Russ Brown Motorcycle Attorney’s Free BAM Roadside Assistance Program before you go. It is a great resource and is solely based on good Samaritan actions. Run out of gas and need help? Someone might be in the area to help you. With roughly 2 million volunteers nationwide in the network, you just might be in luck! Call 1-800-4-BIKERS if you have any issues on the road, and the Russ Brown crew will search for someone who can help. 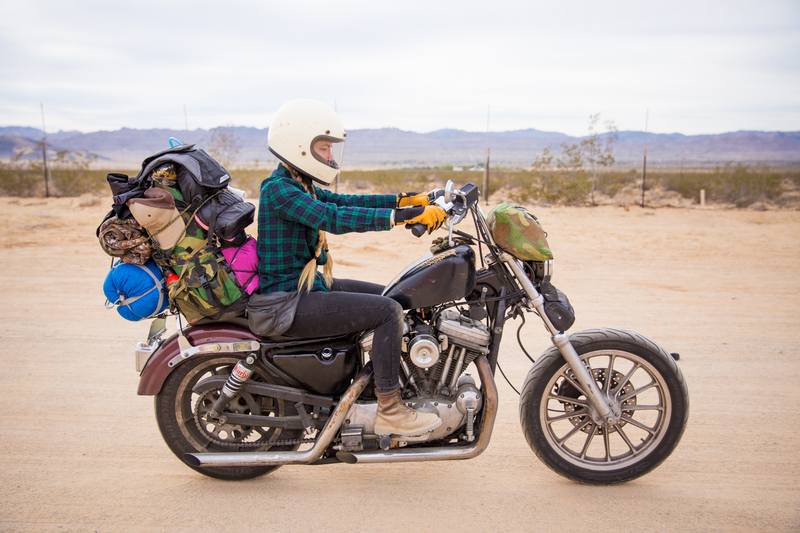 They’ll also be on site with some basic mechanical help in case you need assistance upon arriving in Joshua Tree. 2. Know your motorcycle! 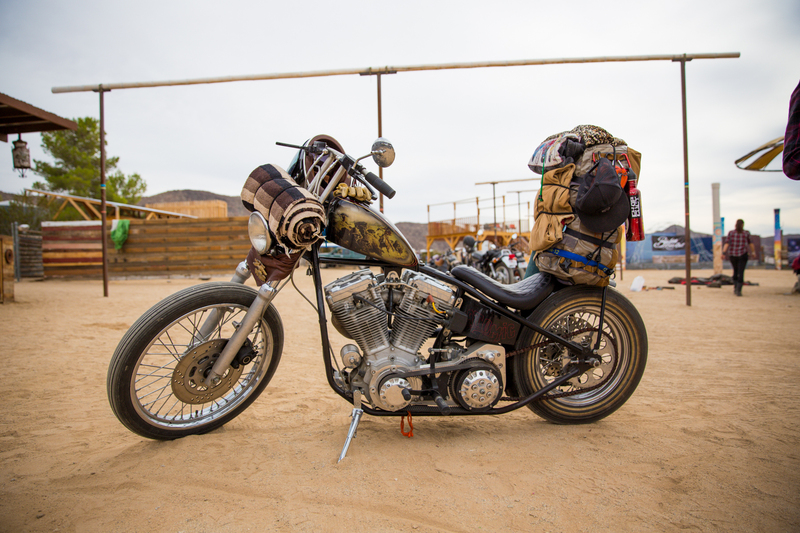 Are you riding a customized chopper? I hope you know which bolts rattle out before your journey, and pack some zip ties or a few extra bolts (or both, and let’s be honest. Zip ties are the best thing to bring with you on a trip no matter what. They’re so useful!!!!). Riding a newer bike? What tools are needed for simple fixes that you can handle doing on your own? You don’t need to take an entire toolbox with you on the road, in fact, with the help of the ol’ trusty Google machine, you can put a pretty simple tool roll together that saves space and weight, usually. But if you’re not great at mechanics, perhaps just bring a few zip ties and bungee chords for starters. 4. Time for a checkup – Be sure to have a knowledgeable mechanic go through your bike. Fresh oil, lubed cables, proper tire inspection, and other multi-point inspections go a long way. Check your battery and terminals before you head out. Well maintained machines tend to break down less. If you own a newer Harley, I highly suggest purchasing an Extended Service Plan. It is essentially an extended factory warranty. So if your battery goes bad, or your stator or god forbid you to have motor issues—you are typically covered for $50 per incident, and the ESP is valid at every Harley-Davidson dealer in the country. I swear by these plans (no, not the prepaid maintenance from your local dealer, those are a waste in this case). 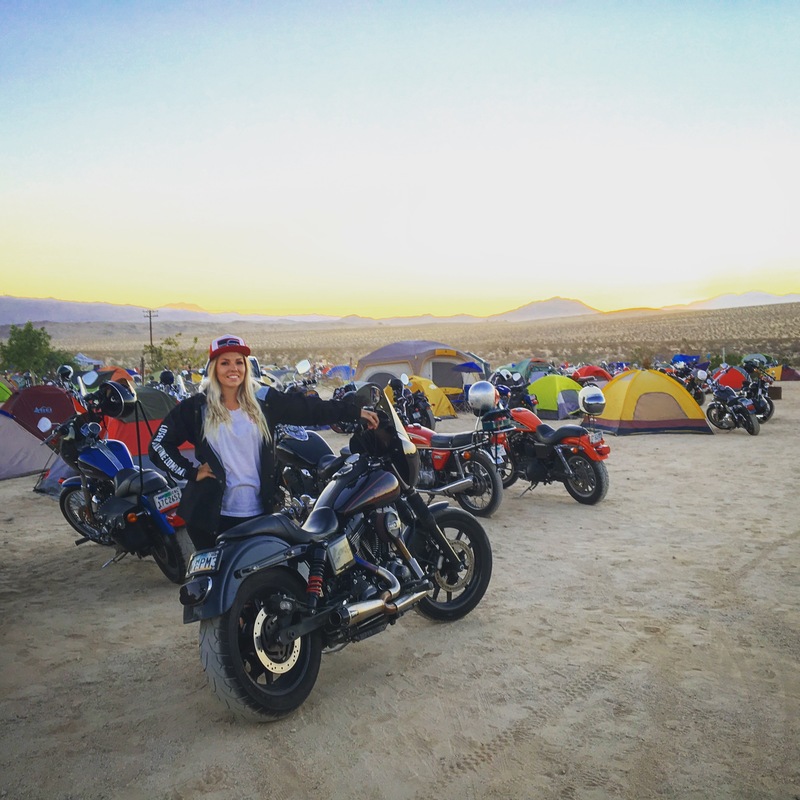 Also, if you do end up having some major issues, your ESP covers a rental motorcycle for up to 10 days of usage and also a tow within a certain mileage. Completely worth it! Also, if your bike is extremely new (within 2 years of your purchase date), you are still under factory warranty, so if anything (well, almost anything) goes wrong, you just gotta get your bike to the nearest dealer and it should be taken care of. 5. What to pack: Don’t overpack. Easier said than done for us ladies, I know. Wear one t-shirt on your ride days. You’re going to be in the elements, even if it’s just sunny skies and wind. There’s no point in dirtying up 4-5 t-shirts on your trek. If you’re going to be stationary for 5 days, pack up to five shirts. Chances are you’re going to purchase a new one on the trip and wear it immediately, so don’t worry about taking your whole closet! If anything, overpack on underwear because well, pubic area hygiene is good for ya! Consider using travel shampoo bottles, razor, and a toothbrush so that everything fits in your makeup bag. Bring some wet wipes (even the Summer’s Eve brand are good for camping) and makeup remover in travel size, it helps free up space! Remember, you can ship things home, and/or ship things to a friend’s house if you plan to stop there on your way to/from the event. Using gallon size zip lock bags to make your items compress as small as possible and also fairly waterproof is also a good trick to know. 6. Oh, the weather outside is Weather…and you really should be on top of checking it. Being frigid cold is miserable. And being frustrated that you brought too much cold weather gear when it’s 90+ degrees your whole trip isn’t fun. Pack your leathers, a windbreaker (great for insulation even under a leather jacket), and if the terrain tends to call for it, rain gear! It’s also a great insulator and can be used to keep you warm when the temperatures drop. Check the radar at gas stops if it looks cloudy ahead. You’ll be happier that you’re not soaked to the bone if you can help it. 7. Don’t get the stranded flat tire blues. Invest in a tire patch kit with CO2 Cartridges. Patching a motorcycle tire from the outside isn’t a permanent fix, but it’ll potentially save you the hassle of getting a tow to the next town to get your tire replaced. The CO2 Cartridges are the key part here — without them, your tire will still be flat after you patch it. External Patches do not always work, but if it can limp you down the highway, at least you got it taken care of. Stash it in your tool bag and keep on trekkin’! 9. Know your gun laws in each state you travel. California isn’t the most gun friendly state in the world, but in the event that you were to need to defend yourself on the road, you should absolutely carry a weapon. Again, most people mean no harm, but you never know what could happen. If you aren’t comfortable carrying a firearm, that’s okay too. I would at least carry a knife or two if I wasn’t going to carry a firearm, though. Knives can also be helpful during roadside repairs and campfire food preps if that’s your style. 10. Invest in a pigtail and USB charging port for your battery. A pigtail bolts up to the battery terminals and allows for plug and play phone charging. You can charge your phone while you ride, and while you rest at a gas stop. If you’ve checked your battery and it’s sending out correct voltage, you shouldn’t have a problem using the pigtail fairly often. It doesn’t pull that much off your battery’s amps. 11. Remember that YOU CAN DO THIS! 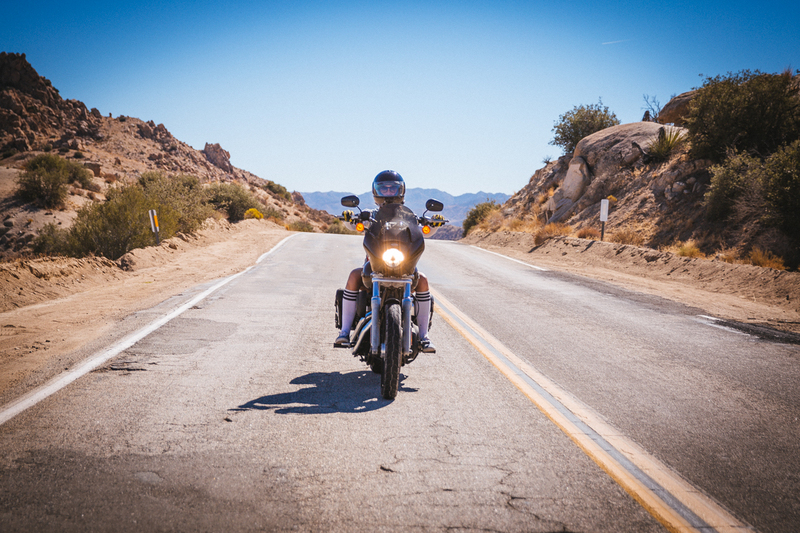 Yes, it can be a little intimidating to ride more than 400 miles by yourself. But it’s not as bad as it sounds. Pros? You can stop and eat ice cream whenever you want. You can stop and use the bathroom as many times as you want without inconveniencing a group. You can stop and enjoy the sights and sounds as long as you want and take as many photos as you want (take ALL the photos!!!). You can also change your plans and stay a day longer somewhere or change your ride route without it affecting others wants and needs. Riding alone ain’t so bad. And you might learn a thing or two about yourself. You’ll have a lot of time to think, and not worry about any others around you. Cons? Well, nobody was there to see all the great stuff with you. But that’s about it. So there you have it. Just do it! 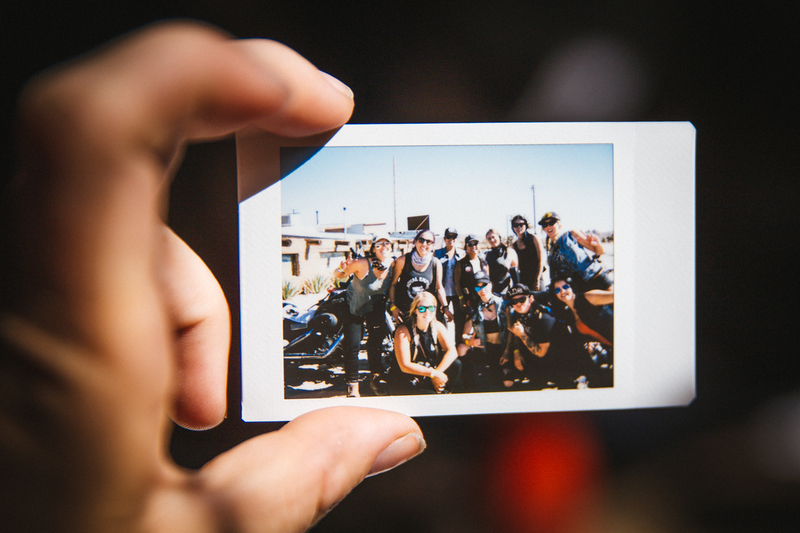 Babes Ride Out has brought dozens of great people into my life. And had I not set out alone on my first trip to Joshua Tree back in 2014, I might’ve never made the friends I did that are now like family. Try to link up with folks along the way, but even if you have to ride solo all the way to the event gates, enjoy the ride, and take it easy. Throw those headphones in or your stereo up, and have the time of your life. One last thing, if you see a motorcyclist stopped on the side of the road, stop and help them. 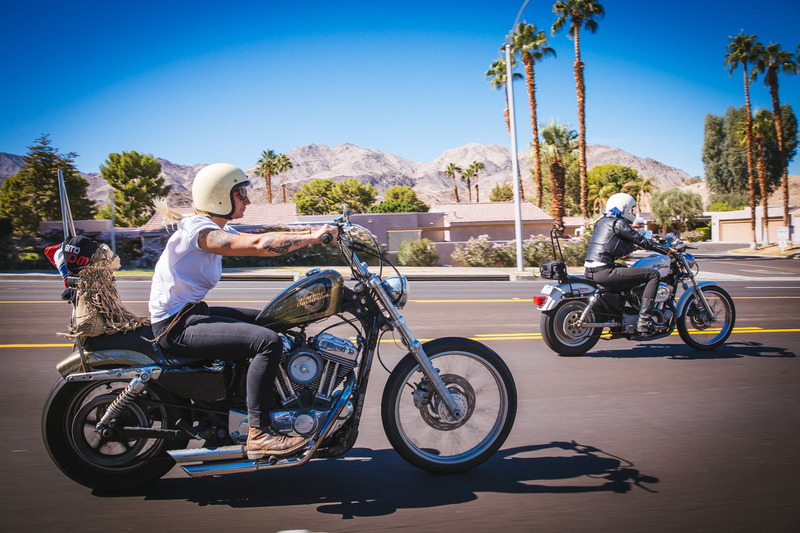 It’s good karma, and you just might find yourself a riding buddy for a little while! See y’all on the road.